Reading a P&L or an annual report is an art. It requires a minimum working knowledge of accounting principles to make sense of all the numbers. So not everyone is going to be able to do a detailed financial analysis of a stock they are interested in. At the same time, investing into stocks on the basis of just a “good feeling” or a “hot tip” is a sure fire way to lose money in the market. So what does one do? Here is a quick checklist I use when I want to grasp the health of a stock quickly, without spending too much time. 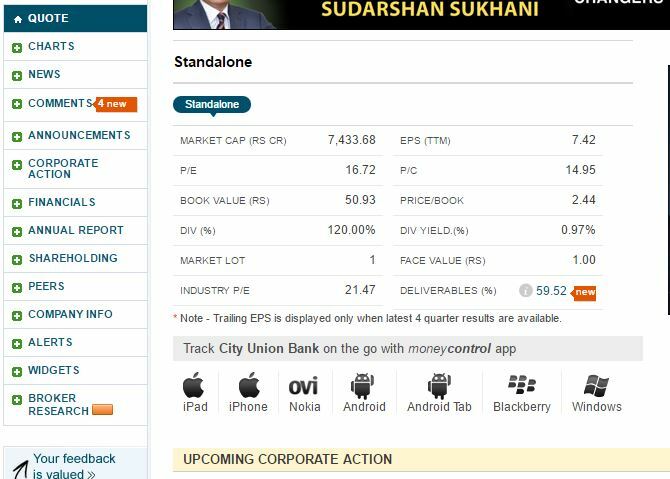 I have used the “detailed view” of a stock from the website www.moneycontrol.com as a basis for the data, so that we can use screen grabs and explain where the data exists. One could choose to use any financial data site of course. I suggest you go to the site and open any sample stock page now,so that you can refer when required. Here are the 5 steps I use. 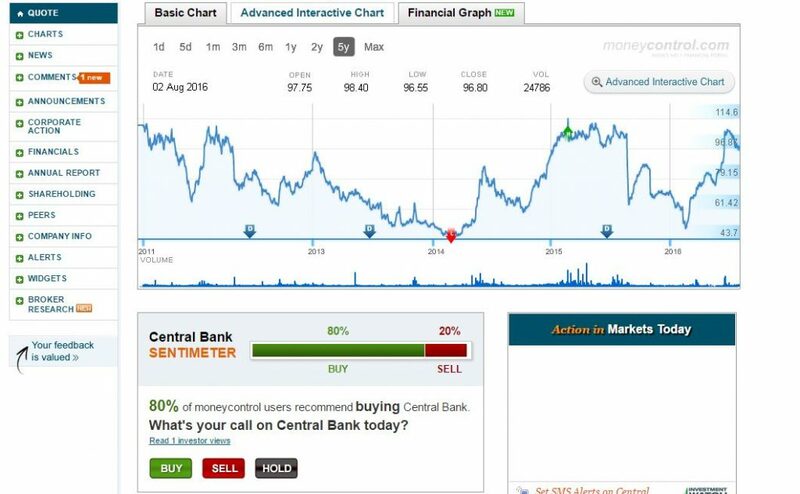 Check for volatility: Click on the “quote” section and look at the 5-year price chart of the stock. A choppy chart with sharp falls and peaks indicates a high beta stock that may be news or operator led. These kinds of scrips tend to be favorites of traders and often do not deliver the best returns to long term investors, though there may be moments where timing the market perfectly gives you great returns. But if you aren’t watching the market like a hawk, you are likely to miss the peaks. A solid, stable stock on the other hand will have a chart that goes up fairly linearly, except for dips where the overall market went down. A defensive, slow moving stock will show you the median price that it keeps returning to over time. If it is in a trough, it could mean an opportunity for a quick punt. One can also take a look at the “sentiment meter” at the bottom, just to get a sense of what the street perception is, though that is certainly not scientific. Note: The “advanced interactive charts” option will allow you to superimpose EMAs and Bollinger bands etc that I don’t understand well enough myself. So not getting into that discussion. Fundamental metrics: Within “quote” itself, scroll down to the “consolidated or standalone figures”. This will tell you the market cap of the company, price to earnings ratios, book value etc. Take a look at the “book value” of the company and compare it to the stock price. Crudely put, book value is the liquidation value per stock if the company was to be sold today. If the stock price is actually below the book value, this indicates that there is some negative sentiment about the stock. Perhaps they are holding huge debt and servicing it is making them unprofitable. If your research tells you that this is a temporary situation and the company is fundamentally stable, then intuitively you know that some day the market has to value it at a fair price close to, or greater than the book value. That could be a safe bet to take if the company or segment is likely to do well in the long run. The other metric to look at is the “P/E” (stock price to business earnings) ratio. This gives one a good sense of whether the company is valued reasonably, given how much it is earning as a business. When compared to the “Industry P/E” it gives one a sense of how this particular company compares to the industry average. Typically if it is well above industry average then it needs to be a star performer for the price to keep increasing. On the other hand, if it is well below, then it could either be a genuine laggard, facing a temporary problem, or a new entrant that has not yet been valued at the level it should. In the last two scenarios, it flags a stock that could see significant growth in price. I typically don’t bother with “dividend%” etc because how much dividend is paid out depends very much on nature of promoters and may not be a reliable indicator of business health. Analyst reports: Within the “quote” tab itself, scroll down to “stock advice and research reports”. This is a good section to get a feel of what the analysts are saying about the stock and the price they are predicting based on expert analysis. Base financials: Within “quote” again, scroll down to “financials” which is the quick view (not to be confused with the detailed financials tab on the side). Here one can see how the recent Quarterly performance has been, as well as the summary of the “Balance sheet”. Under Balance sheet, look first at how much “debt” the company is carrying as opposed to its “net worth”. In most other cases, a high level of debt is a red flag, especially if it is a significant part or larger than the net worth. What this means is that the company is going to lose a lot of profits to interest payments or debt servicing as it is called. And in the event of a bank crisis (as in the case of KFA) if a call is made to repay loans or liquidate shares, then there will be a crisis if the net worth is low. Of course, there is a strong counter view in the market that all debt is not bad, and indeed, it is important for companies to be holding debt as it indicates they are investing into growth and not being conservative etc. But in India, money is expensive and high debt companies tend to bleed in slow growth environments such as what we have seen over the last few years. It can literally bring great companies to their knees. Note: There is an anomaly in the case of financial product firms, banks etc that are in the business of borrowing and lending. Their debt will naturally tend to be very high as it is the nature of the business. Next we can look at the “Quarterly earnings” and the “net profits” per Q and add them up. This gives you a quick view of how profitable the company currently is. Hold the quarterly revenues total in your mind so that you can compare it to previous years revenue later. That will give you a sense whether the sales are growing year on year. Detailed P&L: Click onto the detailed “Financials” tab on the main dashboard and scroll down to the “Profit & Loss” The very first line on top are the annual revenues figures. Looking at this line will give you a sense of whether sales has been growing year on year. You can also compare the current Qtrly earnings to the previous years. Scroll down on the P&L to “Expenses” and take a quick look whether any of the line items is spiking suddenly. For e.g. if “cost of materials” suddenly spikes, it may signal that raw material has become expensive and this is going to affect the profitability of the company in the future as well. The “finance costs” will indicate how much proportion of the profits is being eaten up by debt servicing etc. The “Profit/Loss For The Period” line will give you a sense of overall profitability of the business. If margins are thin (as a % of revenue), it may not be a great business to be in even if volumes are high as it may mark commoditization of the category. The “Earnings Per Share” (EPS) line is usually my last stop. This is a sort of magic metric that consolidates all the variations and gives an overall health picture. If the EPS is steadily increasing year on year, that is a reliable indicator of a good stock. A share whose EPS fluctuates up and down may be indicating an unstable business while a reducing EPS indicates trouble. Bear in mind however, that EPS is earnings divided by number of shares. So if there is a one-time stock split or fresh issue of shares, the total number of shares in the market will increase and there will be steep drop in EPS from that particular year. This anomaly needs to be adjusted for. So that’s it then.. these are the 5 steps towards a quick verification of a business’s health. One can go on and on of course… peer review, chart reading, detailed financial analysis so on and so forth. But it is also worth remembering that no amount of data analysis can replace an intrinsic understanding of the business and the segment it is in, because data is always backward looking. For e.g. past data would not have told you 10 years ago that Eicher Motors was going to boom 100x, but if you saw that the wait list for the motorcycle was stretching to over a year and the company was relatively debt free and there seemed to be no competition coming up in its segment, then you would have figured that this is a great bet. Similarly, the other day I heard someone say that he thinks La Opala is a good bet, because as time passes Indian kitchens will see fewer steel vessels in prosperous homes and there isn’t too much competition in the domestic market. While no one can predict the future accurately, it is also true that such insights will never be thrown up by past data. So it’s absolutely important to marry business insights with data to arrive at intelligent conclusions. Happy Investing! This entry was posted in Economy, finance, General, Uncategorized and tagged equity, equity analysis, fundamental analysis, investing, stock analysis, stock market, stock picking, stocks. Bookmark the permalink.